Friendswithyou’s online shop has beed down for a few months now, and they didn’t make it to the Designer Toy Awards, so it’s good to hear they’re still alive and kicking. 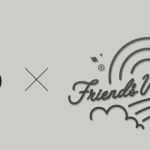 Blank You Very Much and Friendswithyou are hosting a contest that lets fans create FWY’s next shirt. Just download the assets and template here and get designing. The deadline is November 5. Buy it:  Friendswithyou Have Powers!